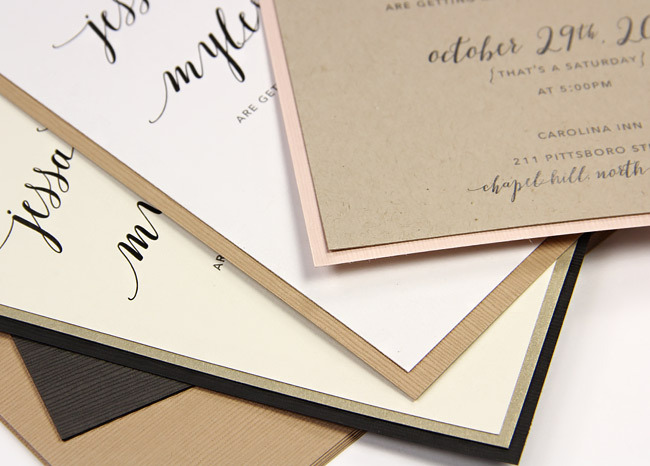 This is not your average linen card stock folks! 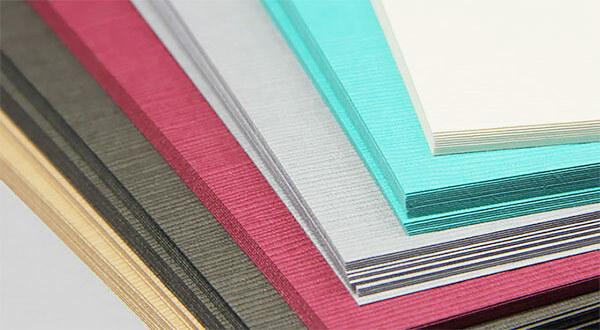 Japanese Linen card stock is heavily embossed on one side with a highly unique, linear-like texture that some say looks beachy, some say looks natural, some say it resembles wrinkly cloth. Whatever it looks like to you, it makes for some highly interesting designs! Does Japanese Linen have color and texture on both sides? Japanese Linen has color on both sides but not texture. The paper is heavily embossed on one side, so the texture is more prominent on the side it is embossed on, and visible, yet less prominent, on the reverse side. Does Japanese Linen have matching envelopes? No, unfortunately Japanese Linen is sold just as card stock, not text paper, so no matching envelopes are available. Can I print Japanese Linen at home? 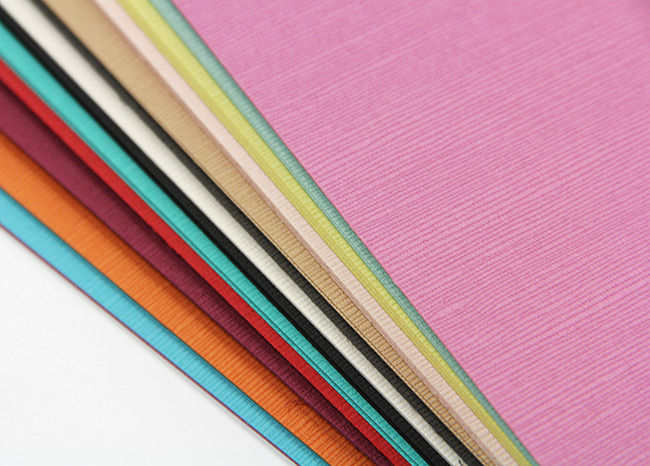 Japanese Linen is a heavy 90lb / 243gsm card stock that has a prominent grooved texture. If printing at home, we recommend using a mid-high grade ink jet printer with a top feed, as paper can pass through smoothly and wet ink can get into the deep grooves of the texture. Japanese Linen does not print well with a laser, as toner can not get into the texture and coverage is typically spotty. What are some ways to use Japanese Linen without printing on it? If you are not able to print on it, try Linen as a backer card or invitation wrap (make into a folder or gate fold, for example). Japanese Linen also makes nice greeting cards (write on the inside), packaging, paper crafts, and scrap book pages. Does this linen actually come from Japan? It sure does! It is an authentic Japanese import. 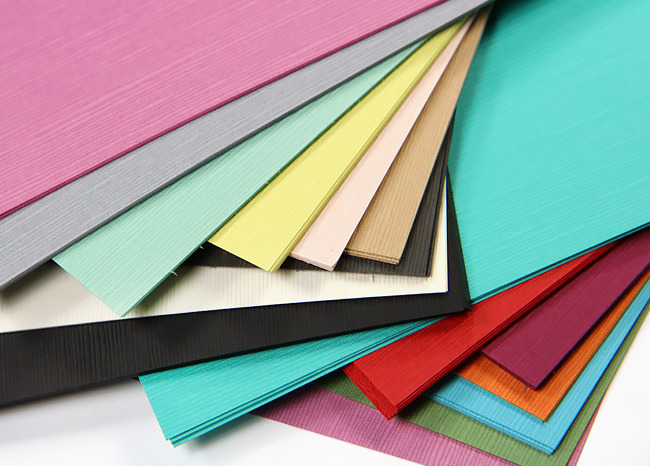 However, unlike some of our other Japanese papers, it is made by machine, not hand. Japanese linen has a jagged linear or grooved texture that some say resembles wrinkled cloth. It's funky, distinct, and different. 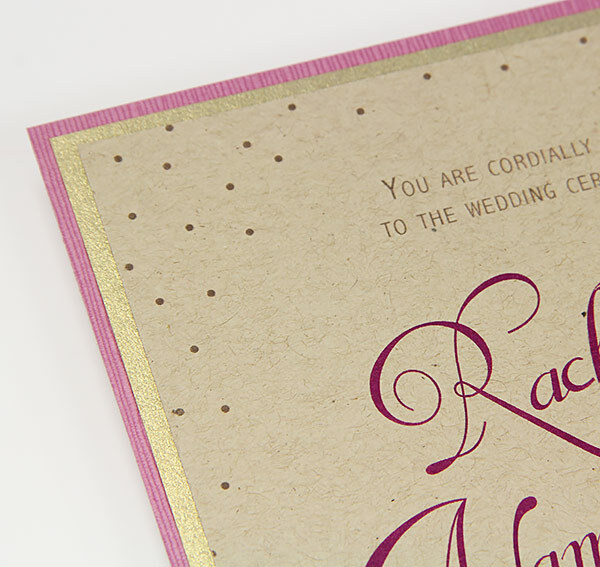 Sheets are heavily embossed on one side only resulting in prominent texture on the front and a fairly smooth reverse side (some remnants of embossing are visible). Choose from a super saturated palette of almost two dozen colors! Classic to contemporary, subdued to vibrant, Japanese linen offers something for everyone. Due to its heavily embossed texture, Japanese Linen may be difficult to print,* making it perfect as a decorative invitation layer or backer. *Japanese Linen can be printed with a mid-high grade ink jet printer or with conventional methods such as letterpress or stamping. 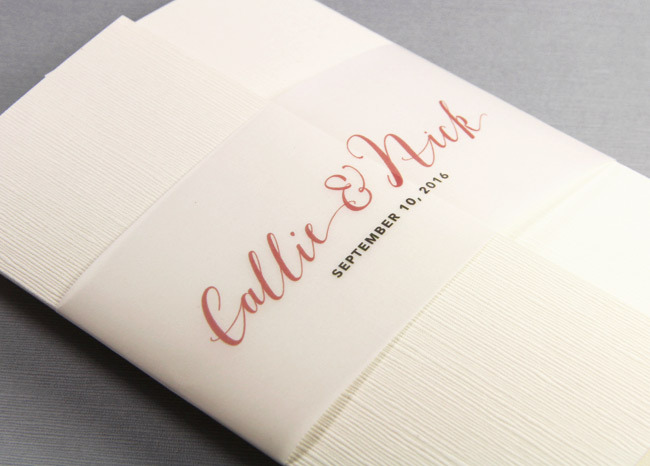 Linen also makes a good invitation folder or wrap. 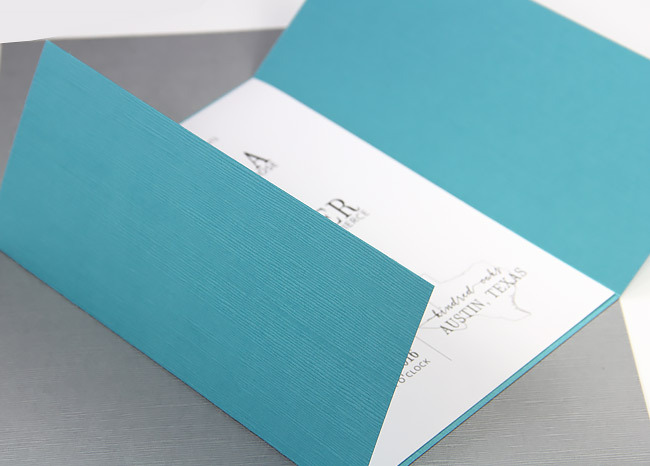 Here, we surrounded an invitation in fantastic texture by wrapping it in a DIY Turquoise Linen gate fold. Here it is again in Ivory, a customer favorite, decorated with a printed translucent vellum band. 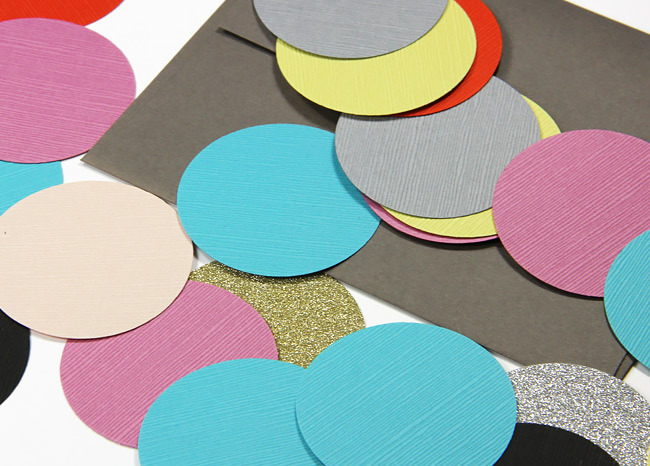 With all this bold texture and color, Japanese Linen isn't just great for invitations, but for paper crafts of all sorts! Think greeting cards, scrapbook pages, packaging, gift wrap... the sky's the limit!